As climate change impacts are increasing the likelihood of natural disasters, such as floods and landslides, having a thorough disaster risk management plan is become more important for communities throughout the Hindu Kush Himalaya (HKH). The government of Gilgit Baltistan in Pakistan has recognized the efforts of the Indus Basin Initiative of the International Centre for Integrated Mountain Development (ICIMOD) and consortium partners to establish more resilient mountain villages through partnership with the Gilgit Baltistan Disaster Management Authority (GB-DMA). As part of this effort ICIMOD built the institutional capacity of GB-DMA to enable the transition from a response-based approach to a proactive one by updating the Gilgit Baltistan Disaster Risk Management Plan. 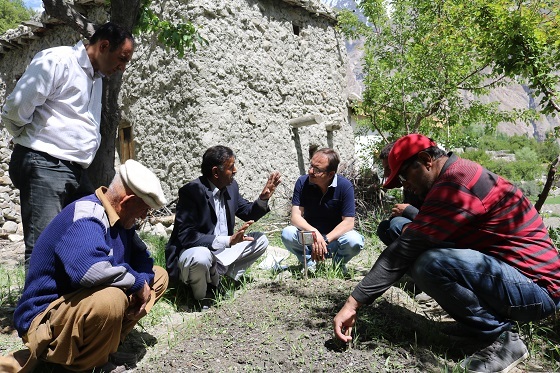 Building climate resiliency in Gilgit mountain villages: hazard management and irrigation systems; biological engineering and bio-briquettes to protect croplands; and high-value orchards. Establishing hazard management systems in Gulmit, Passu, Gulkin and Hussaini through customized Community Based Glacier Monitoring and Early Warning Systems (CBFEWS): CBFEWS for Debris flow in Damas, Flash flood in Sherqilla and GLOF in Passu. Gilgit-Baltistan is home of the Hindu Kush, Himalaya and Karakorum mountain ranges. The region is combating climatic variations that lead to disasters like avalanches, glacial lake outburst floods and torrential monsoon rains. All of these disasters trigger socio-economic changes in the communities they affect, further aggravating community livelihood options in areas with already limited agricultural opportunities. Other partners include the Pakistan Council of Research in Water Resources, Karakorum International University, Forest Department GB, and Pakistan Agricultural Research Council. This initiative is part of ICIMOD’s River Basins Programme, Indus Basin Initiative. The transboundary Indus basin, with an area size of 1.1 million sq.km, is spread across Afghanistan, China, India (33%), and Pakistan (52%) with the upper portion resting in the Hindu Kush, Karakorum, and Himalayan ranges. The basin ranks among the most important in the world in terms of human dependence, supporting about 215 million people directly or indirectly. The upper part of the basin is the main source of water for agriculture, energy production, industrial use, and human consumption for the entire basin. I would like to suggest that a detailed analysis of the impact of theses initiatives on the lives of common people should be published by the concerned authorities. As being a student of environment and natural hazards, i have witnessed the difference of results between described projects outcomes and the actual ground realities in terms of disaster coping development for the inhabitants.